The thyroid gland is responsible for producing hormones that regulate the body&apos;s metabolic rate, digestive function, muscle control, brain development, mood and bone maintenance. Research has shown that the active ingredient in our thyroid support, Forslean® has been shown to help increase mental capacity and thyroid hormone production. We combine this with other ingredients that have been linked to underactive thyroid including zinc and selenium. This unique blend helps support healthy thyroid function while reducing stress in the body. Weight gain is common in hypothyroidism and one of the key ingredients, Forslean® (Coleus forskohlii extract) has been clinically shown to help promote a healthy weight. 1. Chung HR. Iodine and thyroid function. Ann Pediatr Endocrinol Metab. 2014;19(1):8-12. 2. USA · ForsLean®. ForsLean®. https://www.forslean.com/research/clinical-studies/usa/. Accessed March 6, 2019. 2. Chandrasekhar K, Kapoor J, Anishetty S. A prospective, randomized double-blind, placebo-controlled study of safety and efficacy of a high-concentration full-spectrum extract of ashwagandha root in reducing stress and anxiety in adults. Indian J Psychol Med. 2012;34(3):255-62. 3. Henderson S, Magu B, Rasmussen C, et al. Effects of coleus forskohlii supplementation on body composition and hematological profiles in mildly overweight women. J Int Soc Sports Nutr. 2005;2:54-62. 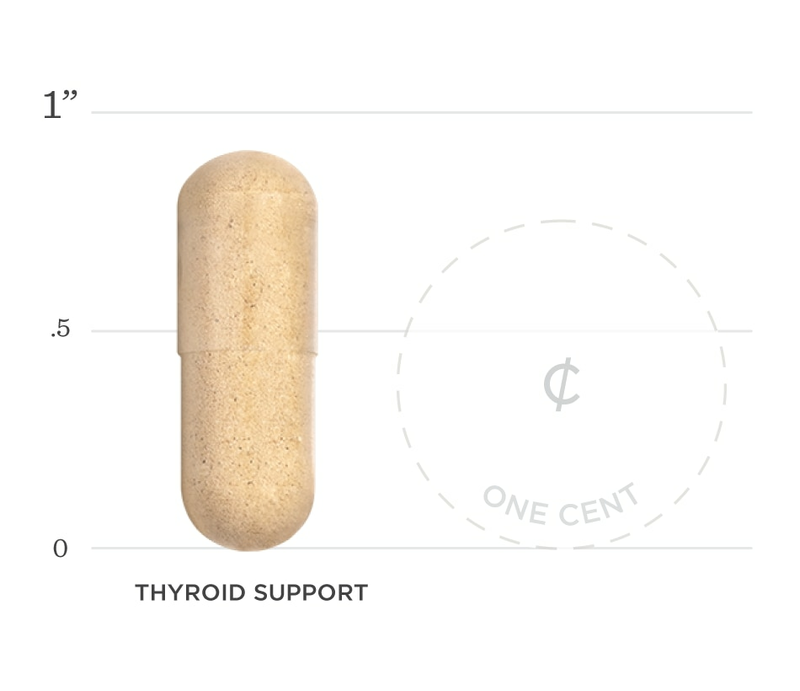 Below we've broken down the main functions of our Thyroid Support and the benefits it can provide. Iodine is directly linked to thyroid health, as the two main hormones produced by the thyroid, triiodothyronine and thyroxine, contain iodine. Research has shown that adequate iodine levels help regulate thyroid function. Ashwagandha is one of the key ingredients in our thyroid support, and has been shown to help the body respond to stress as well as perceived quality of life by reducing serum cortisol levels. 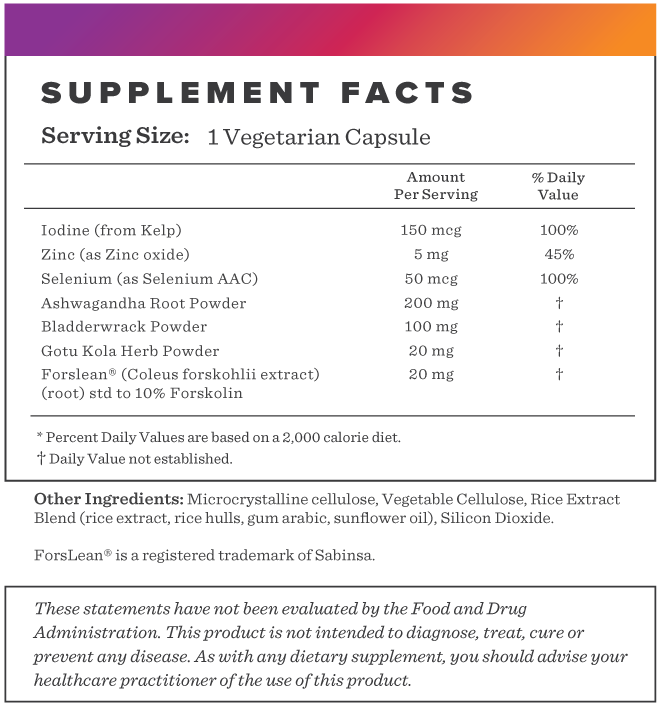 Forslean® has been shown to help with weight management by increasing lean mass and decreasing body fat percentages.